I'm sharing this week's burger tonight in enough time for you to add it to your Labor Day menu, which you should definitely do. I knew Joe would like it, since A.1. Sauce is one of his favorite things ever, but I was surprised by how much I enjoyed it. I'm more of a Worcestershire girl myself. I do, however, love pretty much anything containing caramelized onions, which was definitely the part of this burger I liked the most. As a wink and a nudge to Jessie's rodeo burger, I added some sliced banana pepper rings to our burgers, which only enhanced the flavor -- and added a nice crunch also. 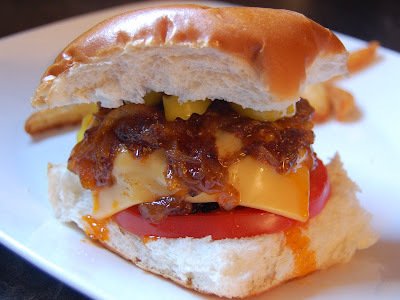 This burger would be perfect for a cookout; I'm definitely going to make it for our next one! burgers 5 minutes on each side or until cooked through. minutes or until golden brown, stirring frequently. Stir in steak sauce.